While we spend our days experiencing the evolution of the Web in real time, the mid and long-term trends are now starting to emerge. Two significant Web analysts released reports in the past week that highlight the trend. 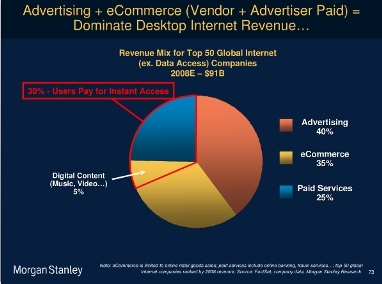 Mary Meeker's Morgan Stanley report on Internet trends embraces mobile as the game changer in the evolution of the Internet. 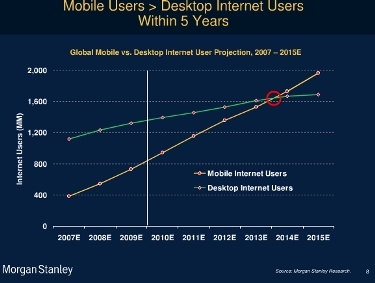 She predicts that mobile users will exceed desktop users within five years. At that time, mobile will cross 1.6 billion global users, on its way to 2 billion, as desktop levels off at about 1.8 billion. In particular, Meeker points to 5 trends converging: "3G, Social Networking, Video, VoIP, and Impressive Mobile Devices." Meeker doesn't yet have the iPad on her list of "impressive mobile devices," but it certainly will be once the 3G version is released. Driving the growth in users and minutes are Facebook and YouTube, social media and video. Video in particular is driving the rapid growth in Mobile Internet Traffic, with mobile data rising 39x by 2014. Wow. Meeker points to Apple as leading the Mobile Innovation ecosystem, for now. But she cautions that user-experience and price will determine the long term winner. The shift to mobile Internet is going to have a profound impact on Advertising, On-Demand Content and eCommerce. 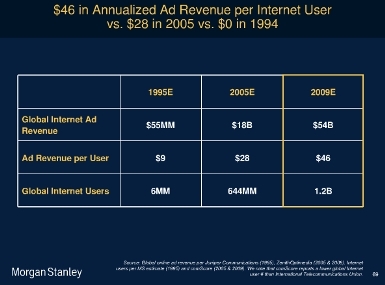 In particular, Meeker reports Annualized Ad Revenue per Internet User growing from $28 in 2005, to $46. The combination of location-based services, devices, mobile Internet users, and more content and e-commerce companies offering On Demand services, is driving a remarkable shift in dollars and behavior. But Meeker is quick to point out that the ability to access a trustworthy billing system for micro-payments (in particular Apple's iTunes store) makes impulse buys for both content and apps an appealing behavior for consumers. 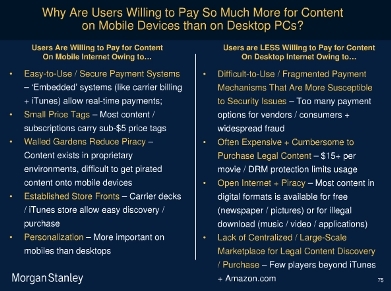 Here, Meeker makes a compelling argument for why consumers are treating commerce and content differently on the mobile Web than they do on their desktops. Meanwhile, Investment Banker Terry Kawaja of CGA/Savvian released data that coincides with Meeker's report. 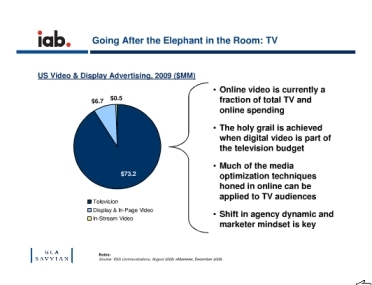 Kawaja says that the elephant in the room is the looming shift of what is currently still television advertising budgets. He points to the relatively tiny percentage of the U.S. Advertising spend of $80 Billion. He goes on to say, "Much of the media optimization techniques honed in online can be applied to TV audiences, and a shift in agency dynamic and marketer mindset is key." Kawaja says, "Forecasts show the interactive channel growing to $50+ billion in 5 years. This represents a linear, evolutionary approach. The challenge is to think revolution, not evolution. Think new definition for 'interactive' to go beyond online, including digitally-addressable video (aka TV), Offline commerce enablement, Mobile." As Kawaja explained it to me, "Historical impediments to the growth of digital media are going away, convergence of digital (online and mobile) with traditional TV will open up a much larger market opportunity for digital players and it is important to focus on holistic, cross-channel solutions to capture the larger TV and offline market opportunities." These two incisive reports, published just days apart from each other, serve to illuminate a dramatic and critical shift in the very nature of the Web and the economics that are growing around it. Within five years, the Web will be essentially mobile, location- and user-aware, and driven by micro-payments. The changes will further accelerate the growth of a la carte content, hastening the demise of cable-bundled programming and creating real economics for both niche ad supported verticals and micro-payments for on demand content. For anyone who's been putting off engaging in the mobile way, the Meeker report should make one thing clear: the mobile Web is now within our grasp, and any further procrastination could be expensive. Kawaja's report to the IAB is equally bracing; dollars that are poised to move from old media to the Web should turbo-charge the next five years of growth as Meeker's and Kawaja's trends operate in tandem. Fasten your seat belts, 2015 is right around the corner.